Properly caring for the trees on your property is a job for the professionals. 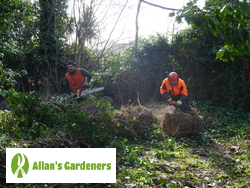 When you need those professionals to have the necessary training and qualifications, talk to Allan's Gardeners about professional tree surgeons in London. We can be with you in a very short amount of time in an emergency situation with a dangerous tree for example, and operate seven days a week, every week. Unlike other tree trimming companies, we have the tools and expertise needed for everything from careful tree pruning to complete tree removal, including felling and stump grinding. This is your one-stop service for all the tree maintenance you need. One phone call gets you everything. Why Do Other People Use Us For Tree Care Services across London? What To Expect When the Tree Care team Arrives? Your phone call or online support contact will let you arrange the time that's right for you out of our flexible schedule. 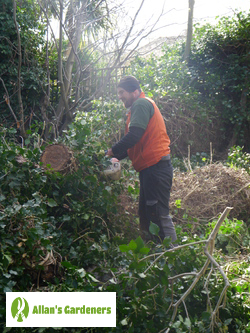 You'll then see your arborists turn up on time, ready and able to start work immediately. You'll show them the tree in question, they'll check to make sure that we've got permission to deal with it meaning that it isn't owned by your local council, for example - and then we'll ratify the quote that you've been given over the phone. All members of the team can both maintain the health of the crown of your favourite arboreal feature, encourage fruit growth, trim and prune for size, or completely remove. Just let us know what you need. Because of tree surgeons' training and experience, we're fully aware that using the best equipment on the market isn't just a preference, it's a matter of necessity with professional tree surgery in your area of London. All of the chainsaws, safety equipment and so on that the team is armed with are the most effective available. What's more, every arborist is fully insured. 020 3746 3128 is the number to call to make your booking, and of course, we have online support features as well, in the shape of the chat facility in the bottom-right corner of your screen, and our booking form. The latter you can fill in anytime to request a callback while both of the former are staffed by live gardening consultants 24 hours a day, 7 days a week. All you'll need to confirm with us is that you've got permission to address the tree in question.